Is Gov. Eric Greitens getting revenge by not playing politics with ballot timing? The popular line of thinking is that leaving measures popular among liberals on the November ballot could drive Democrats to the polls and aid McCaskill. JEFFERSON CITY — Gov. Eric Greitens has angered parts of the Republican establishment by not moving some liberal-leaning measures from the November ballot — inaction perceived by some as retaliation against Attorney General Josh Hawley. The Missouri Constitution empowers governors to change the date of proposed constitutional amendments, which in 2018 includes two ballot questions on legalizing medical marijuana, as well as a redistricting and ethics reform proposal known as "Clean Missouri." Whether those issues appear on the August or November ballot could affect voter turnout and have implications for the U.S. Senate race where Sen. Claire McCaskill, a Democrat, is in a pitched re-election fight. Hawley, who is favored to win the GOP primary, is her most likely challenger. The Clean Missouri initiative is funded in large part by unions and a group financed by liberal billionaire George Soros. The measure would create a nonpartisan position in charge of drawing political maps and is seen as a more attractive issue for Democrats than for Republican voters. And while polling on legalizing medical marijuana has shown support across Missouri, it appears more popular among self-identified Democrats and independents than Republicans. According to Secretary of State Jay Ashcroft, Greitens has said he won't shift the timing of any of the upcoming measures. But Greitens — who currently faces separate felony charges on suspicion of invasion of privacy and computer tampering — has not made up his mind, according to his official spokesman, Parker Briden. "We are still awaiting potential legislatively-referred measures, which would need to be taken into account before final decisions are made," Briden said Friday afternoon. "We have not taken any option off the table." The popular line of thinking is that leaving measures popular among liberals on the November ballot could drive Democrats to the polls and aid McCaskill, an effect that could be mitigated by putting them to a vote in August instead. Some Republicans have interpreted Greitens' inaction as a shot at Hawley, who has publicly called for Greitens to resign and has said the attorney general's office has uncovered evidence that Greitens committed a felony. "Eric Greitens is now doing everything he can to endanger our Senate Majority," said Republican consultant Gregg Keller on Twitter. "And all of it in a fit of personal pique." James Harris, a GOP consultant, agreed. "I have no doubt allowing the various progressive ballot measures to go to the November ballot instead of August was a deliberate effort on the part of the Governor to get back at Attorney General Hawley," Harris said in an email. "It is common knowledge the Governor is angry at the Attorney General for conducting a thorough investigation and telling the people of our state about evidence of potential criminal activities the governor may have committed," Harris continued. "The ballot referral is one of the few tools that Governor Greitens has to make it more difficult for Josh Hawley to defeat Claire McCaskill in the November election." Briden called this line of criticism "ludicrous." "That never entered the picture until this fictional narrative was invented by a few operatives hoping to drive the Republican Party apart," Briden continued. A spokeswoman for Hawley's campaign did not respond to an inquiry. Complicating matters are ongoing maneuvers by Republicans in the Missouri General Assembly to protect or re-enact the "right-to-work" law Greitens signed last year. Right-to-work, which is how supporters have referred to the law that bans mandatory union dues, was suspended after labor organizers successfully gathered more than 300,000 signatures to put the law to a vote of the people in November. The Senate passed GOP-backed legislation to move the "right-to-work" vote to August — when voter turnout tends to be smaller and more conservative. The House, meanwhile, has given initial approval to a measure to add "right-to-work" to the Missouri Constitution, instead of state statutes. Doing so would allow Greitens to set a special election date or leave the vote in November. With one week to go in the legislative session, neither resolution has been passed by both chambers. 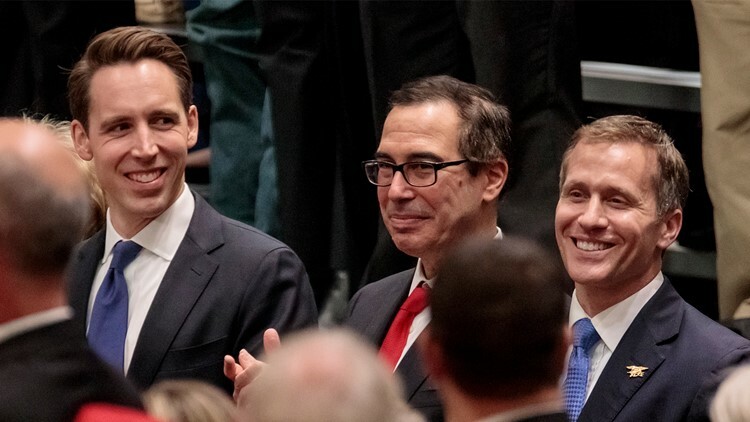 Two political observers contacted by the News-Leader downplayed the idea that Greitens' move was an intentional political ploy. "I don’t think it’s fair to see this decision as deliberately vindictive," said Dave Robertson, who chairs the political science department at the University of Missouri-St. Louis. "It could be that the Governor was distracted and didn’t feel strongly enough about changing the dates. If that’s the explanation, it might count as insensitive to his party’s interests, but being at odds with members of his party is not unusual for the governor." "Leaving issues that, in this case, might bring more liberal voters to the polls on the November ballot is defensible because it is the way these matters are usually handled," Squire said. "But I am sure Greitens is happy knowing that it makes things a bit more challenging for Hawley’s Senate race and for the legislative leadership’s apparent attempt to push a right to work constitutional amendment." In Missouri, the governor does not have explicit authority to move initiatives that would change state statute, such as the proposition to increase the minimum wage to $12 over several years. But the constitutional authority for Greitens to move a proposed constitutional amendment is clear and has precedent. In 2004, Democratic Gov. Bob Holden notified election authorities in late May that he was moving a vote on authorizing a casino in Rockaway Beach to the August ballot. However, in that case, signatures had been submitted well before the deadline, and the issue had already been certified by the time of Holden's proclamation. Would it have been feasible for Ashcroft's office to certify a measure before the May 29 deadline for the August primary ballot if that's what Greitens had wanted? Yes, Ashcroft told the News-Leader on Friday, but it would be difficult. "We would have lost some sleep over it. It would have been very stressful," Ashcroft said. "But we've worked with every department in the Secretary of State's office to find workers that could be tasked to help with that process, to help speed it up. And we were planning on not just working eight-hour shifts — it was going to have to be almost a round-the-clock thing. But it's our duty to do what we're told to do in a ministerial thing like that." He noted that if Greitens had asked for more than one ballot initiative to be moved, there would be more questions about feasibility. "We weren't going to do four of them that way," he said with a laugh. "There would have been some resignations probably." Ashcroft acknowledged that he was aware of concerns that the governor could try to move an initiative before certification. "We could move it to the front of the line to process, and then if it got enough signatures to go to the ballot, we would then put it on the ballot when he had instructed us to. Obviously we can't actually put anything on the ballot until we know whether it meets the criteria." Regarding the May 29 deadline, Ashcroft said, "there is leeway beyond that" via a court order, but he did not expect having to follow that path to avoid making matters tougher for local election authorities who have to verify signatures. He also said he was cognizant of timing pressures regarding sending out absentee ballots. Ashcroft noted that technology has sped up the process. Petitions have been sent electronically to county clerks to save several days in shipping time, and Ashcroft says local election authorities are being allowed to use grant money to help process signature pages electronically, as well. Ashcroft, for his part, did not interpret Greitens' decision to leave the ballot measures in place as a political or symbolic message and said he thought the governor was doing what he assumed was best. "I don't see any reason not to give him the benefit of the doubt that that's what he assumed," Ashcroft said, adding, "I'm no expert. There are all sorts of political consultants that will tell you this and that, and I'm not sure they're any better than the weatherman."